Which is to say, it begins in the forests of ancient Bohemia and doesnt conclude until nine o-clock tonight (Paris time). It is a saga, as well. A saga must have a hero, and the hero of this one is a janitor with a missing bottle. The bottle is blue, very, very old, and embossed with the image of a goat-horned god. This is the first Tom Robbins book I ever read, and I absolutely loved it and desperately want to read it again. I am pretty sure it is the only Tom Robbins book we are missing in our collection. I’m retraining myself to enjoy reading again after severely impairing my attention span; at this time in my life, it’s difficult to finish reading anything cover to cover. 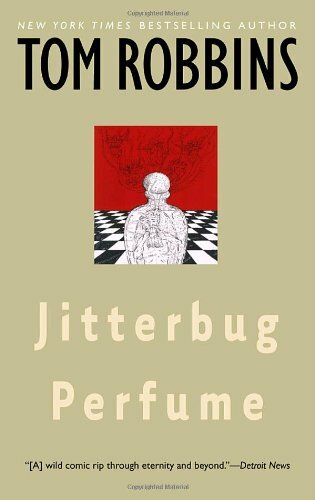 However, I had no issue with Jitterbug Perfume. What a joy to get lost in! This book has everything I want to zone out with: intricate descriptions of beets, the history of perfume, an invisible Pagan identifiable only by his wretched stench, and multiple stories woven together across multiple timelines. It all just works somehow.